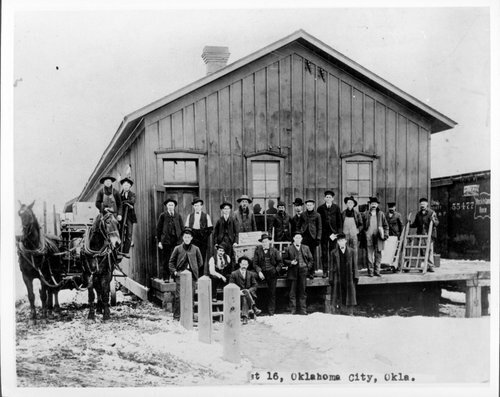 This photograph shows the Atchison, Topeka and Santa Fe Railway Company's freight depot in Guthrie, Oklahoma. The group of men have been identified as, FIRST ROW; Left to Right: Geo. Conoway, Geo. Hartwell, Jesse Cox, F.J. Best, Edgar Powers, and Charles Sittler. BACK ROW; Left to Right: Emmitt Gregg, Frank Sawyer, Jos A. Blake, James Smith, Bert Williamson, Allen Hartenbower, Fred Scothorn, Charles Clothier, Harry Hickman, Thomas Wilson, Jo Woods, and David Smith.